We love flowers. But, we love them most when they’re organically grown. Organically grown flowers are clean (and beautiful) flowers grown without the use of harmful pesticides and herbicides, which means they help keep our environment and us healthy. Whether you’re purchasing flowers from a flower shop, ordering blossoms online, or growing your own flowers, you can have stunning options of the organic variety quite easily. The following is a bit of information we thought you might want to know about when it comes to growing, choosing, and buying organic flowers. We’ve also offered some reasons you might want to consider filling up your life with the beauty, and health, that organic flowers offer. If you grow your own flowers, you’ve probably experienced challenges with pests trying to eat your blooms. When you spot bugs on your flowers, or as a preventative measure to keep bugs away, don’t reach for insecticides! These poisonous substances kill bugs, but they also contribute to contamination of soil and ground water. And, they leave dangerous residue on the hands of anyone who handles the flowers. Instead, spray an oil-based mixture of cayenne pepper and raw garlic on your blossoms. Or, release insect-eating ladybugs into your garden. Flowers grown by conventional methods contribute to the pollution of the environment by leaching poisonous pesticides into ground water, streams, and run-off areas. These poisons affect human, animal, and wildlife health as documented in a 2003 San Francisco Chronicle investigation of contaminated waterways and wells near a lily farm in California. The highly toxic chemicals used on conventional flower farms are known carcinogens, and the EPA (Environmental Protection Agency) is currently looking into the possibility that the run-off from these farms may be harming endangered species. For holidays, and for “just because” occasions, purchase organic flowers and you’ll contribute to a greener and cleaner earth. 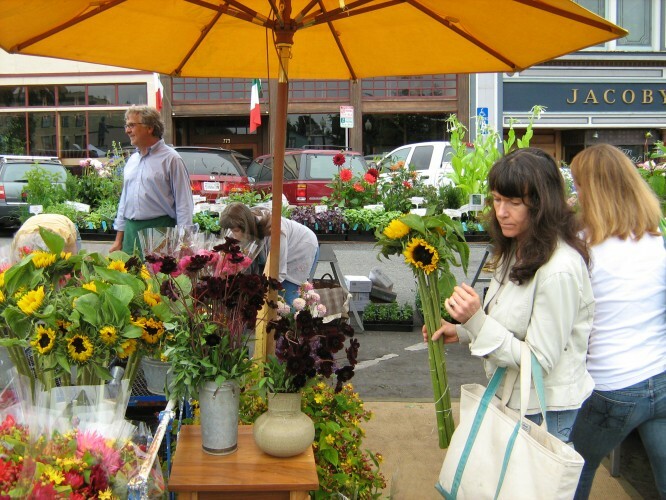 You can find organic florists online and in many cities. If you don’t have an organic flower shop near you, think about growing your own flowers to cut and give. For that far-away friend or family member, you’ll surely be able to find organic options on the Internet to give as a gift. There are many organic flower seeds that you can purchase to start an organic garden. Seeds of Change is a favorite of ours and they even sell organic flower bulbs. You can also buy organic flowers at many flower marts and farmers’ markets, and you can start up a community garden in many cities so that groups of concerned people can work together to keep the environment safe. Do you grown organic flowers at home? Do you have a favorite place to purchase organic flowers? If so, let us know about your experience in the comments below. We love flowers. But, we love them most when they’re organically grown. Organically grown flowers are clean (and beautiful) flowers grown without the use of harmful pesticides and herbicides, which means they help keep our environment and us healthy.Whether you’re purchasing flowers from a flower shop, ordering blossoms online, or growing your own flowers, you can have stunning options of the organic variety quite easily.